I'm not sure that would be the motivation. IMO the Joker's denial of being a freak would be fairly typical of a sociopath who's not in the mood to hide it. At one point, the Joker remarks that he prefers to kill with a knife rather than a gun because guns can kill quickly and without personal contact -- and because, he says, at the moment of death 'people act the way they really are.' (Sorry, this is a paraphrase -- have only seen the movie once so far.) In some ways, that summarizes his relationship with the rest of the world. Enough pain and stress and terror can reduce anyone to acting on their basest survival instincts. That's not all we are, but to a sociopath, those lowest common denominators are what define a human being. And a violent sociopath like the Joker could be convinced that he's the only one around who's superior enough to come to terms with that and even to celebrate it via spreading chaos. In other words, the Joker is convinced that he's not a freak because he's convinced that everyone is just like him -- only less smart and more in need of illusions, which essentially makes them (in his mind) inferior beings to be disposed of in whatever way he finds entertaining. That's an thumbnail of my reaction to this character -- I saw TDK for the first time yesterday and am still thinking over what I want to post about it. Hope a Brokie buys it! 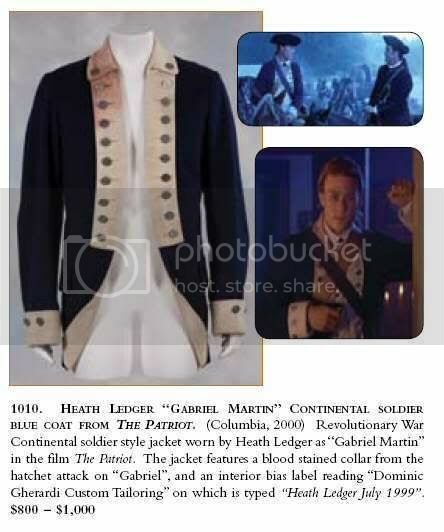 That's my favorite period of history and the costume itself has its own history. Yeah, when he lies still when they take the bag off his face, that was hard to take. I'm still catching up on this long thread and I just wanted to say YeeHaw for this fantastic article. It's so nice to see BBM getting this great attention... and it's really nicely written too. Thanks for capturing this article before it got completely buried, friend Amanda! Funny that when the author finally started talking about the role, he spent most of his words discussing Jack! But it is a great article and rightly pinpoints Ennis Del Mar as Heath's signature role. I sense a Gyllenhaalic there who also deeply appreciates Heath's talent. Sounds awfully familiar. I loved the way he described Heath's portrayal of Ennis as turning him inside out. And this: "He can't live with himself. He can't live with or without Jack. This man can't truly live." Lovely. Thanks, Amanda and Meryl. I agree with all you say.I am not a big fan of this movie genre, and only saw it because of Heath.I would buy it on Dvd so I could just skip through all the non Heath/joker parts. The body bag scene floored me,I was so glad I was on my own and not with the boys who saw it first. I had a really surreal dream after, in which Heath came to life in a funny mix of TDK and real life.He was washed up on the beach here at Sarasota, and I was there with the family.Loads of other people came up to see and out jumps Heath, alive and kicking. I woke up and have never felt so bad.It was one of those incredibly detailed and real dreams.He even told us all why he had done it.I wont bore you with the details, but it was so real. I do think that Heath carried the film, but I am of course a little biased.